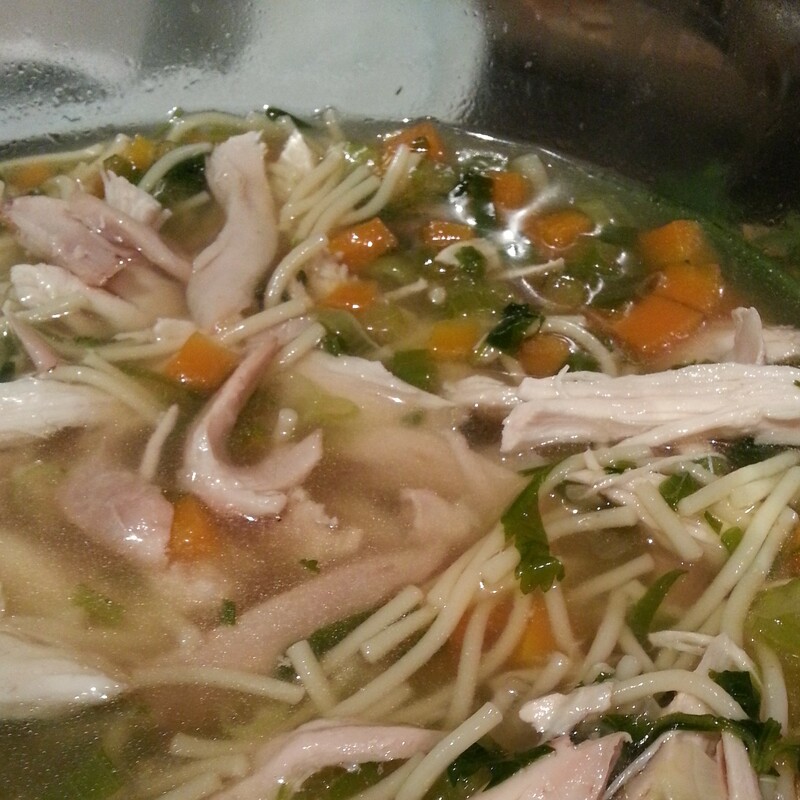 A delectable chicken noodle soup you will come back to time and time again. My favourite season, winter, is finally here. It couldn’t arrive fast enough after an unseasonally warm autumn and the hideous February/March Months of Humidity show. My silence here is the antithesis of what has been going on in real life. Yet another phase of mental instability has befallen me and it has basically been taking all my energy to keep it together for my own health, Chef and the boys. Did I tell you a while back about the friend who told me that I was one of those who has background noise – an unending stream of thoughts going through my head all the time with very little if any rest? Any task is completed while my brain races through not just what has to happen next but what is happening this afternoon, what is happening with the boys, politics, world affairs and oooh what’s that over there. It was a revelation. I thought everyone had that. Don’t they? Apparently some don’t! Apparently some can just wash up and just be thinking about the washing up. Isn’t that amazing? Imagine being one of them. I remember once, early in Chef and my relationship when we were driving along. I asked him what he was thinking and he replied “nothing”. I was floored. How could that be!? He asked what I was thinking about and I rattled off a number of things including a project at work, what we were having for dinner and how on earth a solution to the Bosnian crisis was ever going to be reached. In the last month, after a couple of episodes of breakthrough severe crippling anxiety attacks and a generally low unshifting mood, we have been tweaking my head meds with what I would term “extremely limited” results. My standard unrelenting internal dialogue not only changed gears but upgraded from a family wagon to a maserati which I was not handling through the bends let alone down the straight. The physical side-effects hit first this time – the locked jaw, the weird metallic taste in my mouth, the tension through my shoulders, the poor sleep. And then the internal monologue not only ramped up to a belting speed, the content headed in a whole new direction. That was when I knew it truly wasn’t going well*. Instead of the thoughts focusing on the functional with the occasional dalliance into the woeful state of the political landscape it becomes a swirling storm of greys and black brewing to the perfect insanity storm. It is so strange when it starts. Initially – and where I have been for the last few weeks – I can see it happening and engage cognitive therapy techniques with a dedication usually reserved for my procrastination at cleaning the bathrooms. It’s like I am totally cut off from my body, like a TV producer sitting in the production booth feeding instructions to the presenter – laugh now, intervene here, cuddle now, put the washing on, vacuum, stop yelling, start yelling, cook dinner. All of that interspersed with TRY HARDER, YOU’RE USELESS, YOU’RE FAILING AS A PARENT/WIFE/FRIEND/DAUGHTER, YOU’RE NOT GOOD ENOUGH. It is exhausting in a way I can not adequately describe. At the moment I know those dark yelling whispers are nonsense but I can feel them wearing me down until I succumb to their beat. A discussion with my psychiatrist this week had a new plan of action in place which I have taken a step further. The agitation has reduced by about half. The resting state of panic eased. My sleep has improved, the locking of my jaw ceased and my sense of helplessness ebbed. Curiously this has all happened by me weaning off an anti-depressant, increasing my mood stabiliser and resuming the anti-psychotic. In the midst of all this my GP thought we should test my thryoid levels again. Despite ramping up my thyroxine dose in February I was still barely scraping it in to the normal range. Of course Hashimoto’s impacts mood, libido, anxiety and agitation. I can’t tell you how much I feel like my body hates me (maybe it’s retaliating for *). Wanna swap? * When I first started to see the disc herniating chiropractor he said I had virtually no body awareness. I went to object when it kind of dawned on me that he was right. I have a pretty poor opinion of my body so I tend to try and ignore it as much as possible. It helps that I have 500 children to focus on instead of the fact various parts of me are hurting/not working/breaking down. Anyway, this post wasn’t meat to be that long about my malfunctioning brain. It was meant to be about chicken noodle soup. Do you know I’ve never made it? I KNOW. My friend Beth has one which I used as a bit of a guide for what follows here. There are a couple of steps here so I wouldn’t say you could do all of it when you get home after work, but you definitely could do it over two nights and get two dinners out of it – Hainanese Chicken one night (recipe to come I promise) and chicken noodle soup the next. Or, cook the chicken on a Saturday afternoon and make the soup that night as I did. Whatever you do, just make it. Optional: some finely grated ginger and finely chopped garlic as per Beth’s. Give the chicken a good wash and then put the ginger and garlic cloves in its cavity. Put it in a largish pot* of water, breast side down, with the salt and shallot ends in there (you don’t need to slice these up) and bring it slowly to the boil. Simmer for 25 minutes, scraping off any scum that comes to the surface, then turn off the heat, put the lid on and don’t touch it for an hour. After the hour pull the chicken out of the pot, place it on a plate and wrap the whole lot tightly in glad wrap. If any of the ginger or garlic has escaped from the chicken into the water then scoop out now. What you’re left with is the most delicate, perfectly seasoned stock. You can, if you so wish, chill the stock now and then discard the fat that congeals on the surface. Once the chicken cools get rid of the skin and shred the tasty chicken. You’ll use some in the soup and have some left over. Add the shredded chicken and you.are.done. * By “largish pot” I use one that holds about four litres.